Growth in philanthropy in Russia in 2007-8 was among the highest in the world. But what has been the effect of the financial crisis? Will Russian charities disappear as quickly as they appeared? Experts say not. Private foundations will have to take a different approach, looking less to big business and more to individuals. Fundraisers have noted that private donations have not decreased, while contributions from big companies have. 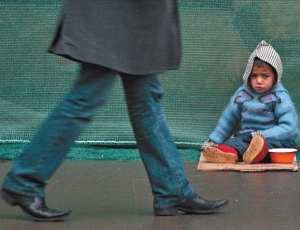 As recently as 20 years ago the concept of charity did not exist in Russia. In historical context, this is not surprising. During 70 years of the Soviet system, society became accustomed to a state that took all the work of caring for the "less fortunate" upon itself; there was no reason for ordinary people to get involved. Nevertheless, when the Soviet Union collapsed, and with it most social programmes, the long-forgotten pre-revolutionary concept of charity was revived. Vladimir Spivakov, conductor of the Moscow Virtuoso Ensemble, started his foundation in the mid-1990s. Then Vladimir Potanin (one of Russia's 10 richest men) started his. And then Dmitry Zimin, co-creator of a major communications firm, founded Dynasty. In Russia today some 20 major private foundations exist, as well as several dozen - perhaps even 100 - small charities. In the last few years this field has experienced rapid growth. According to Olga Alekseyeva, director of CAF Global Trustees, Russia has posted the highest growth rates in philanthropic aid in the former Soviet Union and Eastern Europe. New foundations able to raise between $5-8m a year were constantly cropping up. In 2007 Russian charity totalled $1.5bn. This figure is particularly striking given that Russian law does not grant businessmen tax deductions on philanthropic contributions. But one must consider this important circumstance: Russian society remains largely skeptical of the "new rich", most of whom received their fortunes thanks to the downfall of the USSR. Consequently, people who didn't have the luck to strike it rich during the "turbulent '90s" think those who did should share their wealth. Big business understands this. Moreover, many Russian companies are entering the European and American markets, where society takes philanthropic work very seriously. Until recently, 70pc of the overall budget for Russian charity consisted of contributions from major corporations. True, one can't help but note that charity on the part of Russian business is always highly selective. For the most part, they give money to educational programmes. Dmitry Zimin says his foundation, Dynasty, made a conscious decision to help tomorrow's elite. Vladimir Potanin's foundation, which gives grants to top students, has taken the same approach. The other two most popular spheres for big business donations are culture and children in need of medical attention. Almost no one wants to take care of the elderly or help single mothers and the disabled. That sort of "menial work" is seen as as the government's responsibility. Iosif Dzyaloshinsky, a professor at the Higher School of Economics, says this division shows Russian society has yet to form a philosophy of philanthropy, a need on the part of every person to give. Charity happens fairly spontaneously and by chance. "The way the new rich see things," he says, "they don't owe anybody anything and they only engage in philanthropy according to their mood and the fashion. The new poor do not feel at all grateful to rich philanthropists since charity is their duty." Perhaps one of the biggest impediments to the development of private aid in Russia is society's lack of trust in charities. At a recent conference, Charities in Russia, organised by the Moscow-based business daily Vedomosti, Olga Alekseyeva noted that a poll conducted in Brazil, Russia, India and China showed that Russia was the only country where the largest segment of the population (49pc) preferred to give money directly to people in need. It's the foundations themselves that Russians are wary of, said Alekseyeva, not the idea of charity. The foundations are partly to blame, as their activities often lack openness and transparency. Given the current financial crisis, the question of trust is especially pertinent. It's already clear that big businesses will cut social programmes. Companies are reluctant to talk about this, but recipients of their aid say donations have already shrunk by about a third. Interestingly, though, donations from private individuals to trusted charities have not only not decreased, but even grown. Both the Russian Aid Foundation and the charity Grant Life have noted this trend. Last year Grant Life raised nearly $7m - 57pc of which came from private individuals. In January this year alone, Give Life raised $500,000. Advita, a St Petersburg charity that helps children and cancer patients, has learned that many small donations are better than a few big ones. For several years, the organisation held an auction which raised large sums. This year they called their major donors and realised they would not be able to match previous totals, so they printed some children's drawings as postcards and began selling them for 10 roubles apiece (about 22p) as a joke. "Anyone can afford 10 roubles. We raised nearly $7,000 from the cards," says Advita programme coordinator Elena Gracheva. "We're not asking people to give their last money. We're asking them for just a little. When they stop giving 10 roubles, we'll start collecting kopecks. There are five million people in this city and we have 200 children who need help. Crisis or not, they need medicine." "Philanthropy is finished - Compassion remains" is a slogan devised by Compassion, a volunteer organisation helping hospitals, orphanages and nursing homes, to launch an anti-crisis programme called "Friends of Compassion". The aim is simple: creating a community of people willing to contribute 1pc of their monthly salary. According to the archpriest Arkady Shatov, one of Compassion's founders, "today financial and moral support for the needy is increasingly coming from private individuals. "This is a genuine manifestation of love and compassion for the less fortunate." Perhaps the crisis will help us all become a little kinder. Before 1917, philanthropic work was considered an honorable occupation. In the 16th century the church appealed to the state to open men's and women's shelters in every city. In the early 17th century Peter the Great set up hospitals for invalids and the elderly, orphanages for illegitimate children and helped soldiers. In 1802 Tsar Alexander I instituted the "Beneficent Society" to give money away and to bring those capable of feeding themselves out of poverty. Cassius Clay, US ambassador to Moscow in the 1860s, wrote: "There is not a more generous and humane people than the Russians. No one in Russia is dying of hunger, the way it happens in London, Paris and New York. Charitable societies are everywhere in evidence and Russian aristocrats spend colossal sums to help the needy." By the end of the 19th century it became fashionable for wealthy industrialists and rich merchants to contribute money to foster culture and art. Museums, libraries, schools, picture galleries, and expositions all received money from Russian patrons whose names have gone down in history: Tretyakov, Mamontov, Bakhrushin, Morozov, Prokhorov, Shchukin and many others.